this is one of the most beautiful you made. Aw,shucks, y’all are too much! I’m just now starting a new series, so maybe I’ll do a step-by-step. I’ll have to post them after the spring/summer trade shows. Aw man. I’m going to move into your birdhouse, okay? It’s gorgeous! All, you have all the signs of spring here — daffodils and tulips and robins eggs….. This makes me want to throw my hands in the air and drink in Spring! You are amazing, Krista! Just love the work you do – this is one of my favorites to date. And Expired below is priceless…I remember those days so vividly! : ) Nicely captured. 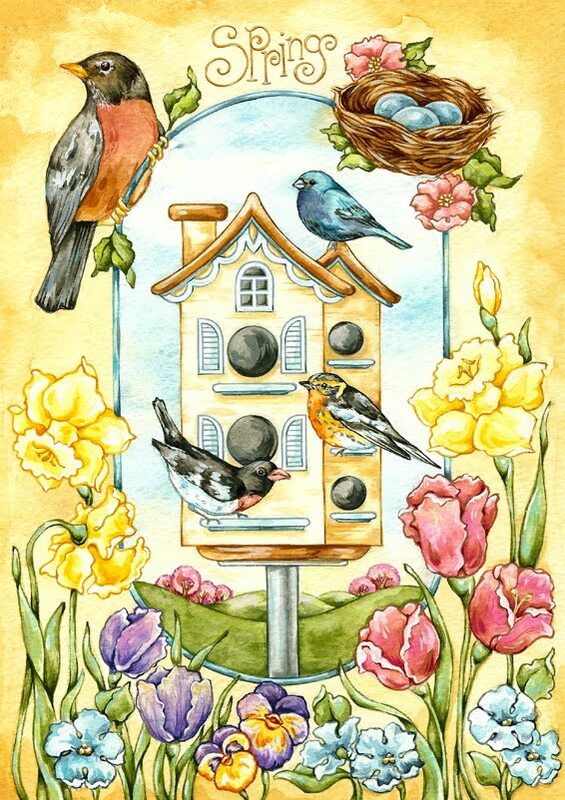 gorgeous celebratory piece, I positively LOVE spring and those sweet blue robins eggs. Yaaay Spring! Yaaaay you for reminding us that it’s Spring. Yaaaay! Stunning work. You are an illustrator’s illustrator.! ok, I’m ready to see a behind-the-scenes video or process series of photos on how you create these beautiful illustrations! You have such wonderful control of this medium. And as others have said, the detail is amazing! Such exquisite detail, just beautiful my dear! this is beautiful Krista, I so love the air in the Spring! Beautiful… truly captures the feel of a warm, delightful spring day. Yippeeee! for spring. I love this illustration. My daffodils have bloomed, too!